The ability of the ReFORCE soil stabilisation system to accurately place geotechnical resin in specifically targeted locations beneath foundations makes it an ideal soil stabilisation technique. Proven and tested in difficult ground conditions the stabilisation has enabled STRESS to carry out safe and efficient underpinning and formation of deep underground structures, in water bearing sands and gravels. This enables conventional excavation techniques to be used safely, economically and prevent foundation settlement. Where there is the potential for uncontrolled settlement and undermining of adjacent properties due to ground movement, ‘running sand’ underneath a building caused by water flow and/or a requirement to stabilise an embankment. View our case study to see it in action. Once the extent of the potential ground movement has been identified, a bespoke design is formulated by our in-house Engineers. 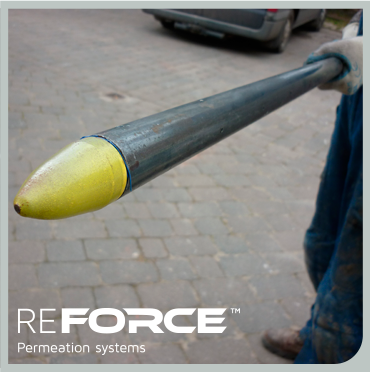 Small diameter holes are drilled around the perimeter of an existing surface structure (slab) and our patented ReFORCE lance system is installed to the required depths. Once in place, the resin is pumped down the lances in precise quantities, to exact points and left to cure. This clever technique allows basement contractors faced with the problem of constructing a basement in water bearing non-cohesive deposits to continue to use safe, tried and tested excavating methods. This allows the adoption of space saving designs allowing for maximisation of the client’s floor plan area. Our ReFORCE soil stabilisation systems provide carefully engineered, proven, efficient and economic solutions for underpinning buildings and structures, anchoring retaining walls and stabilising non cohesive soils. The technique generates its capability from a patented lance delivery system and the specifically engineered geotechnical resin. The quantity, depth and pressure of resin delivery can be controlled exactly which ensures continuity from the pile base to the intimate contact with the underside of the existing footing or slab. STRESS has established itself as a leading provider in the UK of ground stabilising and foundation repair solutions. Our Foundation Rescue division provides a nationwide guaranteed service for underpinning.